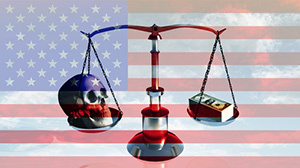 With its easy-money policies increasingly ineffective, the Federal Reserve is now devising a new, even more dangerous strategy – one that threatens the very nature of capitalism itself. You see, the U.S. Federal Reserve fired all its bullets dealing with the fallout from the 2008 financial crisis. That has left the central bank with virtually no policy tools to combat the next major economic setback. That's why the Fed is trying to boost interest rates. At just 0.50%, the Federal Reserve is expected to raise it to 0.75% in December. But that leaves little maneuvering room for fighting the next crisis. And the quantitative easing (QE) bond-buying program has left $2.5 trillion of federal debt on the Fed's balance sheet. The Fed can't really go back to that well, either. At some point in the not-so-distant future, the Federal Reserve will start buying stocks, ostensibly to boost the U.S. economy. We know this because it came up recently in a House Financial Services Committee hearing in late September. Committee member Mick Mulvaney, R-S.C., asked Fed Chair Janet Yellen if the Fed was "looking as the possibility of adding the purchase of equities to its toolbox." Yellen replied that by law the Fed isn't allowed to purchase equities, but noted that "longer term issues and difficulties we could have in providing adequate monetary policy" could cause Congress to reconsider making it possible. Days later, former Treasury Secretary Larry Summers told a Bank of Japan conference that central bank purchasing of a "wider range of assets on a sustained and continuing basis" is worthy of "serious reflection." "Government officials have been mulling this for years despite the fact that this is going to shock many investors," said Money Morning Chief Investment Strategist Keith Fitz-Gerald. "It's in their interest." In fact, many suspect the Fed intervenes in the stock market surreptitiously now by purchasing stock index futures. Buying shares of stocks outright would simply be the next step. Other central banks already have set the precedent. The Bank of Japan has been buying stocks since 2010, although the policy accelerated under BOJ Gov. Haruhiko Kuroda in 2013. A Bloomberg study in April found that the combination of exchange-traded fund purchases and individual stock purchases had made the Bank of Japan a top 10 shareholder in 90% of the Nikkei 225 stock average. The Swiss National Bank (SNB) has been investing its foreign currency reserves into stocks for more than a decade, ramping up the program in 2010 in an attempt to weaken the Swiss franc. All the shares are in non-Swiss companies, with the majority invested in U.S.-based stocks. 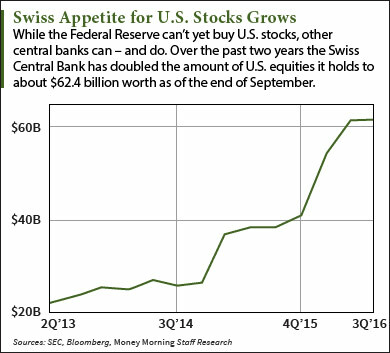 According to Bloomberg data, the SNB held $62.4 billion worth of stock spread among more than 2,500 U.S. companies as of the end of September. Some economists believe the European Central Bank (ECB) will be the next to jump on the stock-buying bandwagon. The ECB is running out of bonds to buy, particularly the coveted German bunds. It's easy to imagine a U.S. Congress, eager for a new source of economic stimulus, granting the Fed the ability to follow the lead of the world's other central banks. The more common stock buying becomes elsewhere, the harder it will be for both Congress and the Fed to resist – making it practically inevitable. But according to Fitz-Gerald, it's a terrible idea that would "undermine the very essence of capitalism."